Within a week he was hit twice. Both times a close shave. Debilitating injury, blinding, or worse, death — anything could have happened. Soon he was back on the streets, protesting again and throwing stones. Three days from the first injury, 15 pellet shrapnels pierced his back. But he won’t give up. First, he took a tear gas shell on his left leg while protesting on the streets of Budgam town. That didn’t deter him. He is on the ‘hit list’ of the police who are hounding him 24×7. When not on the roads throwing stones, he is in hiding. A relative’s or friend’s or any close acquaintance’s home becomes a hideout. And in his hideout, he has dreams like any other 12-grade youth his age — some noble, some nullifying. He aspires to be an engineer. That is, if he doesn’t become a “martyr.” At 17, the attractions of martyrdom are irresistible for him. He is romancing death almost all the time. The azadi bug has bitten him — badly. For the past several months he has been protesting and throwing stones at Indian forces. His game doesn’t end there. He goes around villages pasting posters that call for an end to Indian rule. He loves coining and shouting slogans of azadi. He feels the Indian state in Kashmir can be stoned to death. That romanticised feeling and the political belief it spawns give him an adrenaline rush round the clock. He lives perpetually on the edge, ready to spring up, hit the streets and pelt stones — anytime. “I am restless. I want India to quit Kashmir,” he tells me as I catch up with him during a protest march. He may not want his identity concealed, but I have to take care. So I call him Amir. I walk over to Amir while he is sitting on a shopfront with several teenagers, stones in his hands waiting for an Indian security vehicle to pass by to hurl stones at. With his left leg bandaged at the knee from the tear gas shell hit he took a few days ago, Amir is ‘deliberating’ upon azadi with his friends. He is also raving about his heroics as a specialist stone-thrower. Amir recounts the happenings of the day with wild fervour. The fight he gave to the police, the number of stones he threw, how close he was to the men in uniform, the narrow escape he had when bullets and pellets were raining around. Amir weaves these details into his animated storyline. They become a dramatic part of his personal drama with death. And the politics he — the stone-thrower — embodies. As I sit with him and the other boys by the roadside, Amir juggles with his ammunition — stones — and his thoughts too. “It is noble to die for the nation that is oppressed. 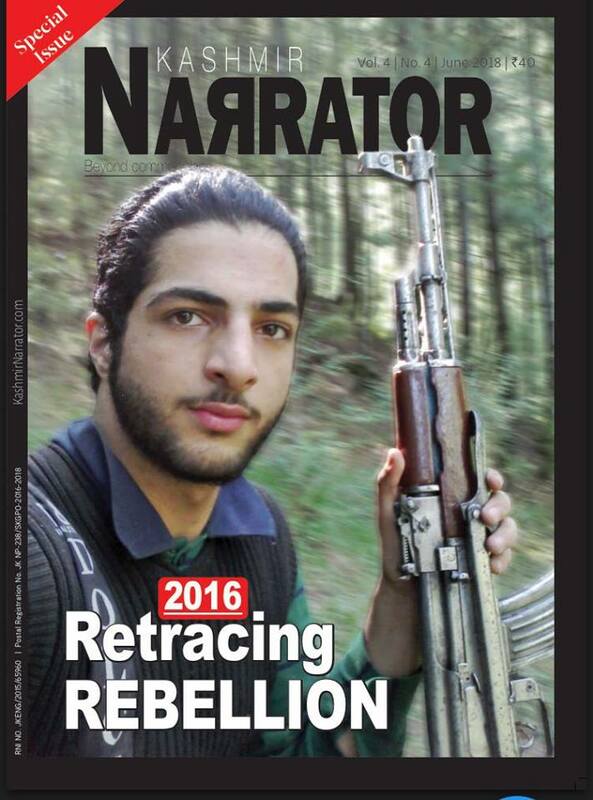 I will be honoured if I become a martyr, like Burhan,” he explains his death wish to me. Burhan Wani, the Hizbul Mujahideen commander killed in July 2016 by State forces, seems to have left a deep impression on Amir’s mind — to emulate him and cast himself in a similar ‘Robin Hood’ image. Curiously, in my conversations with other stone throwers and protesters, I found Burhan’s image exercises a deep motivating influence on the psychology of young protesters. Amir says that he has no fear of getting arrested or killed. “I am ready to die.” The motivation seems real and surreal both at the same time. I push him further to know what caused this loss of fear. “Since my birth, I have heard almost daily that someone has been killed by the army or police. Death became a part of life and gradually fear vanished from me,” he explains. A year ago when he first took to stone pelting, Amir was a frightened soul. “Initially, I would start palpitating and my limbs would shiver and turn numb.” But when stone pelting and protests became a regular affair after July 2016, Amir conquered his fear. The act of stone-pelting and its resultant sugar rush gradually took over his mind. Soon his thoughts were filled by this act, gradually “occupying” his imagination. As I probe further into Amir’s mind and his motivations, he reveals the political dimension of his thought process. “You lose all fear when you throw a stone at the policemen or the CRPF. You are reminded of the things they have done, and this drives you to throw more and more stones,” Amir tells me in a subconscious effort of self-psychoanalysis. To get a better understanding of Amir’s state of mind and his loss of fear, I spoke to psychiatrist Dr Abdul Majid. Usually, psychologists look at the vanishing of fear and the motivation for violent acts through the traditional prism and practices of the discipline. Dr Majid believes the stone-pelter is a “victim” of circumstances: political, social and economic insecurities. He argues that violence of the last thirty years has impacted the people, especially the youth making them angry and restless. “The anger that the youth have makes them impulsive and they turn violent and are ready to meet violence with violence,” Dr Majid explains. Dr Majid says that the majority of the stone-pelters are teenagers who usually come from economically and socially “backward classes”. “Besides that, at that age, their bodies produce very high levels of progesterone which makes them excited and they go on to pelt stones without fear,” says Dr Majid. Without debating that theory, stone-throwing by Kashmiri youth at Indian soldiers has a deep political aspect to it. The scale and intensity at which it is happening despite unremitting violence by state forces against protesters has to be explained through theories of political science as well. Of late, we have seen young teenage school-going girls throwing stones at men in uniform and their vehicles. Surely there is more to this phenomenon than unaddressed trauma of State violence and dormant anger, or even the expedient theory of real or imagined ‘socio-economic backwardness’ of the protesters. For independent observers of the situation in Kashmir, stone-throwing by Kashmiri youth is a political act of defiance and resistance and an expression of rejection of the State and the symbols that represent it. Writer and political observer Arif Ayaz Parray says acts of protests and stone-pelting that we see in Kashmir have three basic functions: to reclaim the lost agency, tell the oppressor that we still resist, and tell the neutral audience that we are registering this through protests. For Arif, the act of stone pelting and protest is an act to reclaim the identity by recovering the ground that has been taken away from Kashmiris by the Indian state. “The protest is an act of telling the state that we are still here and fighting the occupation. It redeems the protester and provides him or her a sense of dignity,” says Arif. The usual explanations that State agencies and its allied media put forth about stone-pelters are that they are paid to do so and are acting at the behest of Pakistani agencies. Such easy descriptions are as much misleading as they are trivialising of a people’s struggle for freedom and political rights. I spoke to several other stone-throwers, one among them the son of a surrendered militant. This 23-year-old and other stone-throwers share a common emotion, though they come from varied backgrounds. They are driven by the strong emotions they attach to “martyrdom” which in part explains why they have no fear of injury or death. The other part is because they have been born and brought up with little else other than violence around them. This boy resonates the same feeling. “What worse can they do to us now? They have killed so many people. They have nothing to threaten us with. It has taken all fear away from us,” he tells me. I broach this curious case of fearlessness of death among Kashmiri youth with Arif. His short reply encapsulates the happenings of the past 30 years and the existential dilemmas Kashmiris encounter everyday. “We live in our death,” says Arif. Najeeb Mubarki, former assistant editor at the Economic Times and a keen Kashmir observer, believes that stone-pelting is “largely symbolic” and it is a way of telling the state of India that the people of Kashmir will resist it in whatever form. “Kane-jung (stone-pelting) carries a lot of symbolism within it. It may not practically achieve anything but its symbolic political and psychological impact is huge,” says Najeeb. For Najeeb stone-pelting is an expression of resistance. I met up with another ‘seasoned’ stone-pelter to get a different perspective on the psychology of protesters. Farooq is known among his friends in Kakapora, Pulwama as ‘the commander’. He is doing post-graduation in Urdu through distance mode. Farooq is an aficionado of poetry. His favourites are Ghalib, Ahmed Nadeem Qasmi and Faiz whom he quotes in between conversations. “For Faiz, his beloved was the revolution, and for me my beloved is azadi,” Farooq tells me. In recent times, Farooq has been on the run. He has been lucky to escape arrest or any injury during protests. In his case, motivations for stone-throwing come from a collective hurt and stone throwing becomes an expression of ethno-nationalistic resistance to oppression. He tells me he is filled with anger against India for the atrocities it has inflicted on Kashmiris. “I am angry. I have seen what they did to us and what they are doing. They have raped our women, killed our brothers,” says Farooq. My name doesn’t matter here. I’m another normal college-going girl from Srinagar studying arts at a local college. And recently I debuted as a stone-pelter. Before that, I had been participating in protests along with other girls over the forces’ brutal actions against students at the Pulwama Degree college. I was angry that day, very angry. I mean how can they do so? The assault made me realise that we Kashmiris are treated like animals by the Indian state. My political views on this subject are pretty simple and straightforward: India is in occupation of my land, and I hate this occupation. So the Pulwama college incident acted as trigger for my feelings. When I went to college next day after the Pulwama college incident, we had a huge protest. I was there too. A first timer. Scared in one way, feeling empowered in another. We shouted slogans —anti-India and the usual azadi slogans. As we moved out on the streets in the heart of the city, the police confronted us. There were scores and scores of them armed with batons and guns. They abused us ordering us to go back. We stood our ground. Then they wielded their batons and fired some tear gas shells. And that was it. We dispersed. But it gave me some strange energy and confidence. And in my first protest, I didn’t pelt any stone. Other girls did. Probably, I didn’t have the courage. Or may be we were dispersed too quickly. Then the protest became a regular affair. Every time the police broke up our protests. But every protest gave me some more strength and courage. Slowly fear vanished like a puff of smoke. On May 9, there was another protest. I remember that date because that was when I threw my first stone at the policemen and the CRPF. That day they fired tear gas shells at us and injured several of us. What is it like throwing stones at the the forces of occupation? That is a question I often ask myself. In that moment of danger and rush of energy when I threw my first stone the feeling was like this: I felt I had freed myself from the Indian occupation. I thought this was azadi. I felt liberated. I flung this stone towards a CRPF vehicle. I don’t know whether it hit it or not. But it was, I believe, a stone hurled at India and its brutal occupation in Kashmir. If you ask me will my stone-pelting achieve anything, my answer is yes. It is our way of telling India they should leave Kashmir. And the repressive situation they have created around us, this is the only way to say so. I also know this won’t drive India out of Kashmir, but at least it sends a clear message: Go back India, go back. I hate the tag of being called a stone-pelter. I am a student, not a professional stone-pelter. My stone-pelting was spontaneous. No one asked me to do it or paid me for it. When my family came to know about my participation in protests and stone-pelting, they wanted me to stay away from it. I resisted and did it again. And I will do it again whenever the situation demands so. I don’t want the occupiers to think they have destroyed us. We must show resistance. Because of my participation in protests I have got interested in knowing more about our history. Now I regularly follow news about Kashmir. Recently I purchased a copy of the Curfewed Night. Even the regular gossips with friends have now been replaced by political discussions. I prod him further for an explanation of this mindset where life has lost value and meaning. “You face disrespect and humiliation at every corner in Kashmir. India treats you as if you are an animal. It is better to die facing them than to live in perpetual humiliation,” Farooq explains to me. But despite his strong motivation, Farooq seems to have little hope that azadi will arrive in the near future in Kashmir. He believes that the Indian state is “too strong” to let Kashmir go. “There are times when I find the whole movement absurd and meaningless. No one is concerned about Kashmiris,” he laments. Faiz’s eternal poem of resistance and hope for the dawn of justice lingers on and then fades out as Farooq dissolves into the haze of another graying evening of uncertainty.